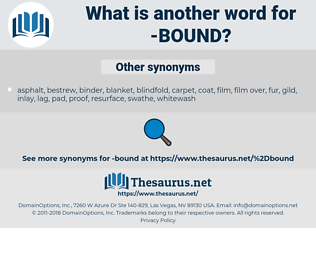 What is another word for bound? benefits, merchants, governors, issues, cons, CRS. limitations, connections, thresholds, linkages, ties, fringes. bonded, minded, reminded, induced, interconnected, identified, circumscribed, Depended, intended, incorporated, Defended, defined, mediated, Contributed, integrated, initiated, Administered, designated, intertwined, ended, destination, Attributed, interpreted, delineated, implemented, restrained, Incarcerated, Responded, Complexed, categorized, coordinated, assigned, suspended, determined, Subordinated, complemented, interfaced, Influenced, dissolved, found, unrestricted, reaffirmed, regulated, adherence, Indicted, predestined, Necessitated, subscribed, combined, constricted, guaranteed, Disbursed, sustained, constrained, surrounded, imprisoned, dismissed, acknowledged, demarcated, explanations, instructed, knit, encumbered, contained, Detained, ascertained, Commanded, prescribed, Jeopardized, conditioned, undermined, Generated, triggered, solidified, dedicated, transmitted, Delivered, Introduced, Translated, dominated, entwined, dictated, encircled, sent, jeopardised, supervised, branded, Predicated, endorsed, Enshrined, derived, confirmed, governed, Submitted, fastened, Adhered, Begun, illustrated, unavoidable, involved, Tended, Stood, reinforced, confined, enforced, spent, Insisted, embedded, Forwarded, directorate, concentrated, kidnapped, destiny, Instituted, advised, Contemplated, evidenced, implicated, obliged, interlinked, Excluded, prisoners, rescheduled, organized, Handcuffed, embodied, correlated, dispatched, circulated, Summoned, attached, united, imposed, attended, delimited, Consigned, fulfilled, recognized, Prosecuted, Bridged, entrenched, sanctioned, committed, commited, disposed, enclosed, Perpetrated, Issued, considered, appointed, adjusted, compliant, organised, pledged, Deployed, motivated, represented, Enjoined, Examined, Challenged, accompanied, established, Brought, immunized, obligated, Persuaded, Denounced, condemned, decided, convicted, perceived, Undertaken, maintained, appreciated, engaged, arranged, included, Incurred, endeavoured, realigned, insured, Recruited, directed, safeguarded, Caught, promised, enslaved, Constructed, allocated, designed, Embraced, Undergone, specified, Upheld, Curtailed, affirmed, developed, Entailed, supported, knotted, founded, retained, compelled, Convened, Grounded, provoked, punished, impelled, devoted, documented, diverted, liaise, guided, outlined, aligned, built, duty, affected, recorded, paired, Compared, enhanced, contracted, strung, addressed, unified, affiliated, Acceded, estimated, joined, acceptance, damaged, Provided, Enacted, Channelled, affixed, qualified, Tendered, severed, Consulted, observed, Coerced, mothballed, Anchored, Bundled, experienced, stuck, implied, reported, Targeted, selected, GONNA, needed, Managed, addicted, exposed, pointed, appropriated, presented, Clamped, partnered, tailored, fettered, fixed, desired, limitations, Stationed, Avoided, pursuant, Complied, mandated, renewed, become, Embarked, contacted, narrowed, forecast, handled, frozen, Prevented, separated, witnessed, enmeshed, seized, reviewed, consumed, bordered, probably, turned, reduced, justified, oriented, Sentenced, preserved, Decried, concerned, required, located, Been, registered, Performed, accused, measured, uprooted, Judged, protocol, employed, Compromised, Operated, Entered, honoured, ensured, scheduled, Roped, Exercised, wedded, presumed, Tempted, sworn, completed, realized, doomed, Worked, networked, inclined, accepted, Suffered, proven, credited, plagued, fined, Arisen, resolved, assumed, forged, drawn, dressed, consent, Lodged, cursed, pressured, hostage, Offered, Deemed, reflected, owned, Assessed, settled, filled, Hampered, Exempted, Cabled, Followed, charged, conducted, Earmarked, Urged, subject, Subjected, Steered, Resorted, Created, Encountered, Fitted, HIT, supposed, ordered, Appealed, allotted, agreed, hired, Staked, driven, chosen, Gained, trapped, assured, signed, hosted, forced, solved, Filed, applied, traced, granted, security, blocked, laid, reserved, valued, left, posed, coupled, Pushed, Strapped, keyed, started, harmed, warranted, missed, Occurred, Pegged, wired, fed, nature, Aimed, must, honored, jailed, Regarded, routed, pursued, Supplied, expected, elected, Launched, tabled, come, Referred, Prompted, used, Served, secured, Wished, matched, fostered, Borne, respect, respected, centred, Resulted, controlled, fated, put, poised, Caused, arrested, Dealt, ruled, manned, hooked, Carried, tested, worn, grown, spoken, cured, Told, shaped, taped, framed, Stayed, Tasked, stored, road, sealed, Lived, Surveyed, Counted, Allowed, set, rooted, Mapped, covered, posted, marred, run, requested, backed, placed, played, always, led, Lasted, focused, focussed, mounted, Asked, Termed, mated, said, raised, given, called, sought, Passed, Logged, Stalled, staffed, faced, Viewed, marked, geared, Taxed, gone, Accounted, cuffed, treated, kept, attempted, Voted, paid, formed, Had, headed, seen, done, party, heard, Met, wanted, based, Meant, tried, taken, Acted, Gotten, 'il, named, Non, made. unobliged, unrestricted, unbounded, Allowed, permitted. faltering, mistrustful, undecided, unconstipated, unresolved, indecisive, indisposed, wavering, distrustful, doubtful, skeptical, unsettled, regular, suspicious, weak-kneed, unsure, unoriented, unconvinced, untreated, reluctant, irresolute, unsworn, vacillating, disinclined, hesitant, dubious, loath, undetermined. let go, unbind, permit, allow. start, open, liberate, release, begin. What we've come for is to help you get clear, an' we're bound to do it. You're bound hand and foot like that. thalweg, periphery, threshold, upper bound, perimeter, verge, border, fringe, margin, rim, brink, outer boundary, lower bound. saltate, burst, bounce, pronk, galumph, curvet, capriole, hop-skip, bound, resile, rebound, reverberate, ricochet, leapfrog, skip, spring, vault, caper, take a hop, recoil, hop, ski jump, overleap.